Here is one. It doesn't have that rolled brim or whatever (photo is blurry). You could add it if you want it. Here is another one, this one is free. You have to be a member of Ravelry to get the first pattern, and maybe to even see them. It is free to join though. 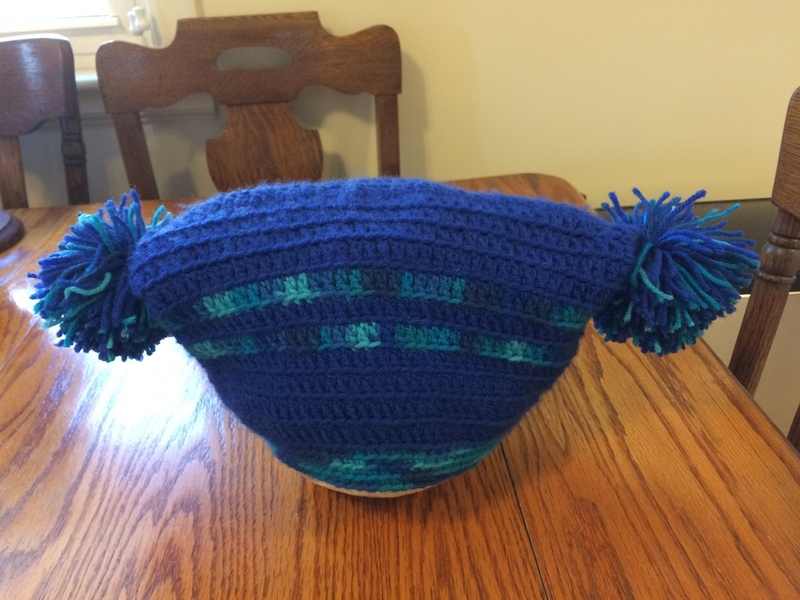 It's really just a tube--you could use any stitch pattern, make a chain the head measurement or slightly smaller since it will stretch a little, make it the length you want and seam up the top (whichever end of the tube stretches the most should be the brim). Sorry I missed this post. If you are still searching, this is one I made for my great grand son. Very easy and quick. Also, makes into other sizes very easily. This pattern is made from top to bottom, not around, so you'd chain more for a taller hat, but make more rows for a bigger 'around' measurement. It's all ribbing, so will be nice and stretchy. You'll be seaming the side and top. Thanks for answering this inquiry Granny Square. I can't get on here quite as much as I'd like to. Hopefully in the near future. To the OP, this sort of 'make a rectangle and sew it up' also works for a more conventional hat, in fact it's the way I made my first hat decades ago. Sew the side seam and gather the top instead of seaming it, then add a pom-pom to cover the gather. The ribs are a bit farther apart on the one I'm looking for & it has the point type ears at the top. Here is a picture of a different pattern I used for my granddaughter. It was fun to make. Cute! Looks nice and warm, love the colors! Try a search under "crochet double pompom (or pom) hat". What's the link for the pattern of this cap?